Tommorow they will play the 1st round of the World Amateur Go Championship 2011. Please share KGS nicknames of players, if you know some. We can start from kghin (Taiwan), Sadaharu (Singapore), Tsunamigo&Diplomat (Russia), windtalker (Malaysia), suponev (Belarus), fukurokuji (Cyprus), Hiphop (Czehia), fj (Germany),spirit (Netherlands). I was surprised to see 85 year old Hirata, representing Japan. His main opponents (China, S.Korea, Taiwan, HongKong) are only 80 years old all together! 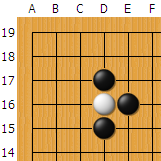 In case of Hirata's success I will propose to send Go Seigen as Japanese representative on Fujitsu/LG/Samsung and other pro events. Someone has to stop Gu Li and Lee Sedol! 4d from Poland on 4/4! Well I never! If you like to watch WAGC games live, you can find them on WBaduk. Enjoy! kghin is representing Hong Kong, not Taiwan. Cyprus - fukurokuji? ?, Slovenia - tiger?? After training as an insei along with Yamabe Toshiro and seeing Yamabes progress, he decided he was too weak at go and so abandoned the idea of becoming a professional. He won the world amateur championship in 1995 after surviving cancer. Thanks for the preview, Alexander. Nice read! I advised my editor to quote it in Dutch magazine GO.